In the early 1800s this desirable address at the south end of Chelsea Parade was home to Gen. William Williams (1788–1870), a successful shipping and whaling merchant, and his wife Harriet Peck Williams (1795–1880), daughter of Capt. Bela Peck (1758–1850), a wealthy Norwichtown businessman. Active in the state militia, General Williams held military drills in the park, long known as Williams Park in his honor. Both William and Harriet were notable philanthropists of their era. 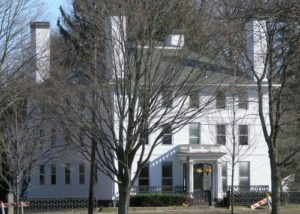 General Williams donated the land for the Norwich Free Academy (#3), while his wife funded the school’s first library, named in honor of her father. Harriet gave the land for Park Congregational Church (#22) – and left a bequest to finance the private Williams School in New London. 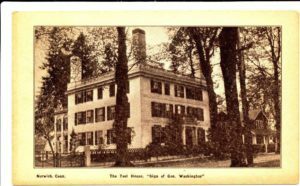 Built by Joseph Teel, the 1789 house, complete with a third-floor ballroom, originated as a post-Revolutionary-era inn, which advertised unusual entertainments, including Italian “rope dancers” and a dancing clown. One of Norwich’s finer examples of the Federal style, it is notable for the understated elegance of its smooth brick façade. Its hipped roof and tall chimneys are also typical of its period. The house’s bracketed entrance and elaborate cast-iron fence, both in the Italianate style, were probably added around the 1860s by the Williamses to make the property more stylish. In 2013, representatives of all the heritage-based organizations in Norwich met to find ways to collaborate, find the fit between the community and tourism interests, make sites and programs come alive, focus on quality and authenticity and preserve and protect resources.